Rabbis Judah Halevi and Moses Maimonides were considered “the two greatest thinkers the medieval Jewish world produced,” and virtually the only point on which they agreed is that Blacks were biologically inferior to Whites. Mr. Foxman's ADL gives to its worthies the “Maimonides Award,” named for the race-hating rabbi who taught that Black Africans were “lower than the rank of man but higher than the rank of the apes.” Both of these “great thinkers” helped make the enslavement of the African practically a religious commandment. Yiddish-speaking immigrants arrived in America using a common term for the Devil: der Schwarzer, the “Black One,” or der schwarze Mann, “Black Man.” This Talmud-inspired belief system became the subtext that drove the cruelty of every lynch mob and every whip-wielding overseer, every Jim Crow enforcer and every race-baiting politician. Today's leaders of Jewish thought have really not changed from the deeds of their fathers. Jesus described them in John 8:31-47. They hypocritically ignore their own history of hate and charge The Minister—our Minister—with scapegoating the Jews just for demanding that they cease their centuries-long racist assault. 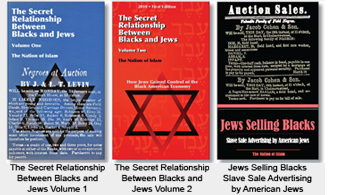 Jewish historians, however, agree with Minister Farrakhan in their most scholarly writings and admit that the Jews have always used Black people as their scapegoats. Let us consult a few of them.